Bring to Bible to life for ages 7-11 with these instant lessons from the ever creative Andy Robb, author of the '50 Bible Stories' series. You want to get a group of kids fired up about a story in the Bible. Great! so does this book! As previous offerings of Boring Bible have proved, Andy Robb's winning formula really hits the mark, this time with the Prophets. With 25 stories brought to life in accessible, lively language backed up by some great cartoons, you and your group will have fun, whilst becoming familiar with the stories and characters. Each double-page spread of the book includes the relevant Bible passage and a bullet-point guide to the basic background and characters involved, which will help you get to know the story first. Then there's a lively presentation of the story, which you can read out loud to your group. Whether in a church or school setting, Boring Bible will be an invaluable aid to your sessions. Boring Bible Instant Lesson Material: The Prophets by Andy Robb was published by Kevin Mayhew in January 2005 and is our 515th best seller. The ISBN for Boring Bible Instant Lesson Material: The Prophets is 9781844172924. 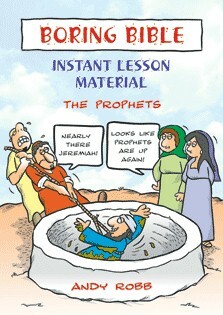 Be the first to review Boring Bible Instant Lesson Material: The Prophets! Got a question? No problem! Just click here to ask us about Boring Bible Instant Lesson Material: The Prophets.